There’s been a lot of buzz about Windows 8 around the web, and, unsurprisingly, at Microsoft’s (NASDAQ:MSFT) BUILD conference. So after a quick head count of the unicorns and ample serving of bacon yours truly decided to dive in and take a look around the new, and quickly changing, world of Windows 8. First, let’s look at what everyone else is saying about Windows 8. Dwight Silverman of Chron.com is reporting a positive response to Windows 8. Although he cites a need for more software, acceptance by businesses, success in the tablet market, and proper marketing as sticking points that Microsoft is going to have to address in order to make Windows 8 a success. Mat Honan of Gizmodo also had an interesting take on the coverage of Windows 8 and the different noises people are making about the OS. Titling his article, “If you already hate Windows 8 then you hate technology.” It quickly becomes obvious why Honan supports Windows 8. Lastly, PCWorld’s Chris Brandrick is showing off Windows 8’s new Blue Screen of Death (BSOD) which is significantly less scary looking and even includes an ASCII sad face. But enough of what others are saying, let’s take a look for ourselves. To install Windows 8 on the testing platform I had to do a USB install. This was a relatively easy process that has carried over from Windows 7. The minimum requirements say that you need a 4 GB flash drive, but if you use the 4.8 GB .iso that’s offered on the BUILD website as I did, you’re going to need to use an 8 GB device. After completing the installation I began noticing a few small changes here and there. Windows 8 was responsive and snappy, which is an improvement considering that Windows 7 would slow down occasionally on this platform. 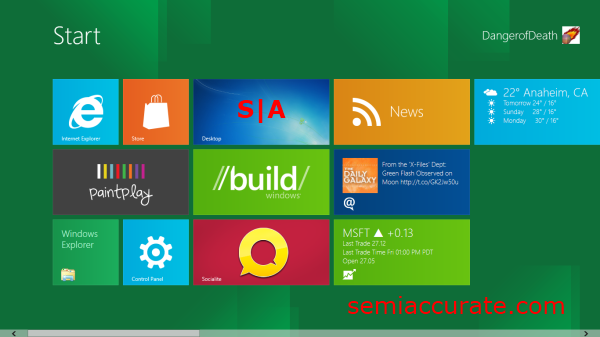 Buttons have gone from rounded to square in Windows 8. This is most apparent when looking at the window controls in the upper right hand corner of your desktop applications. In addition to those changes the Aero flip application switcher has been replaced, with applications now sliding to the right a bit and then the next application popping on to the screen when the same key combinations are used. Gadgets work exactly the same as in Windows 7, which is nice because the Metro weather application would not change its location from Anaheim. This was even after I enabled location data in the control panel. The desktop weather gadget had no such issues and was happy to inform me of the overcast conditions outside my office. 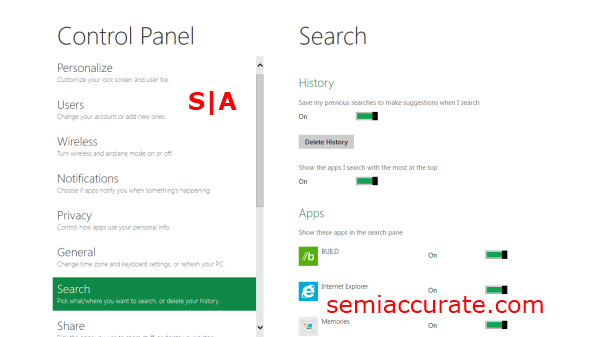 It seems that what Microsoft is trying to do with the UI is to give you the best of both worlds. The world of Metro, where the applications are small, contextual, and of a specific style; and desktop world, is where applications are massive, self-contained, and designed for you to create, rather than consume content. The idea of different interfaces that are designed for using different styles of programs gives me so much hope for Windows 8, this is the idea that gives Windows 8 the potential for success. This is also the one point where Microsoft cannot fail to impress. It needs to give users the ability to work in both the Metro and Desktop worlds in a synergistic fashion. It needs to bridge the gap between the new and the old, while still allowing you to pick between both when it suits you. Let me say something that has been said by many, but deserves to be said again, Windows 8 was designed to be used on a touch screen system. But that does not mean that it isn’t 100 percent usable with a keyboard and mouse. It does mean though that the way you’ve navigated previous versions of Windows is radically different than in the past. Some motions to operate the Metro UI, like switching applications by pulling them from the left, and navigating the new start menu will take some time to get used to, and wrap your head around. There is a learning curve, and it’s rather steep. One of the biggest problems with this preview build is that, simply put, it’s a preview build; and therefore it lacks a variety of well-developed applications to use. In Metro there’s no Office, there’s no Picasa, and there’s no Skype. It’s powerful and widely used applications like these that are going to be the foundation for Windows 8’s acceptance in the market place. Microsoft really needs to act like Nintendo, and release all of its bread and butter applications for this new Metro interface as soon as possible if it wants to give business users a real proof of concept. The classic Windows 7 start menu was definitely missed while I was climbing my way up the Windows 8 learning curve. If I learned anything from using Windows 8 it’s that I really rely upon the start menu to navigate my way through Windows 7. Using the new start panel is a rather obtuse endeavor for some who feels at home in Windows 7. The new windows explorer combined with the search option in the new start menu replaces the functionality I used the start menu for. Internet Explorer is pretty much what you’d expect. 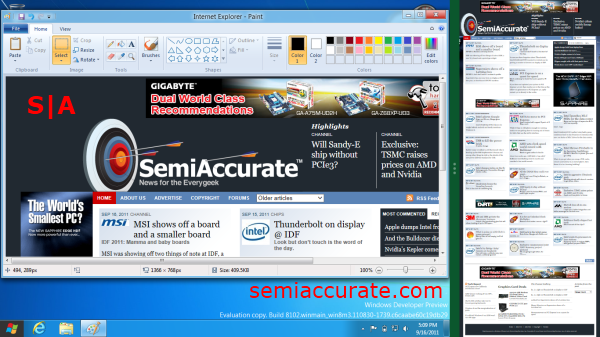 There are two versions of it; one designed for the Metro UI and one for the Desktop UI. They both run off of the IE 10 browsing engine and work in a similar fashion. Of course, the desktop version was more straight forward for me to use because it worked the same way as IE 9. 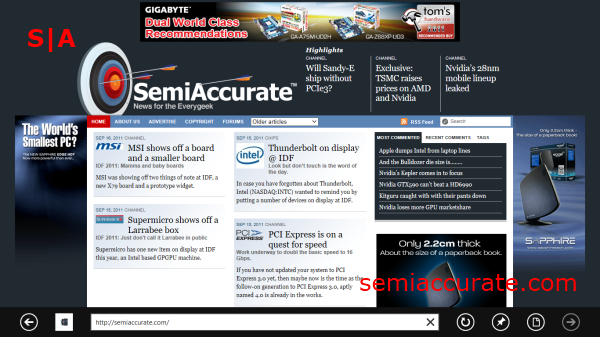 But I did eventually start using the Metro version to browse, because I liked the uncluttered display better. Logging off in Windows 8 is like playing Russian Roulette. Sometime it will take just a few seconds, and sometime you’ll have to wait for 5 or more minutes while it is working behind the mysterious veil of the log off screen. Admittedly there is still a prompt to force the closure of the applications that will come up occasionally. But for the most part you’ll be forced to sit and wait for it to finish whatever it’s doing. Hopefully Microsoft will look into improving log off times, which is really the key to enabling effective user switching. The lock screen in Windows 8 is refreshing. The imagery that Microsoft has selected is really quite nice, but as always more variety is a good thing. The image based password is an interesting concept that can also ease the stress of trying to remember what you changed your password to this week. But a standard text based login is also available. The whole experience feels fluid and well put together. Although the change from the beautiful full screen pictures of the lock screen to the login menu, with its stark off green background, can be rather abrasive. Microsoft said that the new task manager would be an improvement, and if they’ve done anything right it’s the new task manager. The applications status column actually gives the user useful information now, and the resources usage columns are more intuitive due to the highlighting system which visually selects the applications that are using the system the most. Overall the new task manager is a much more visually effective creation. AMD drivers work in Windows 8, but they are only offered through the Windows Update service, and therefore are missing the Vision Engine front end. The maturity of the drivers offered for the Windows 8 platform is also rather questionable. I mean they do work, as in the hardware functions, but it’s not necessarily as fast as it would be under Windows 7, particularly in OpenGL tasks as you’ll see in a bit. 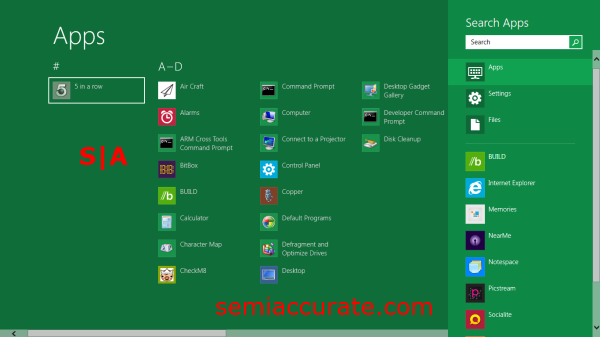 The “God Mode” present in Windows 7 works in Windows 8 and there a few new settings available to boot. 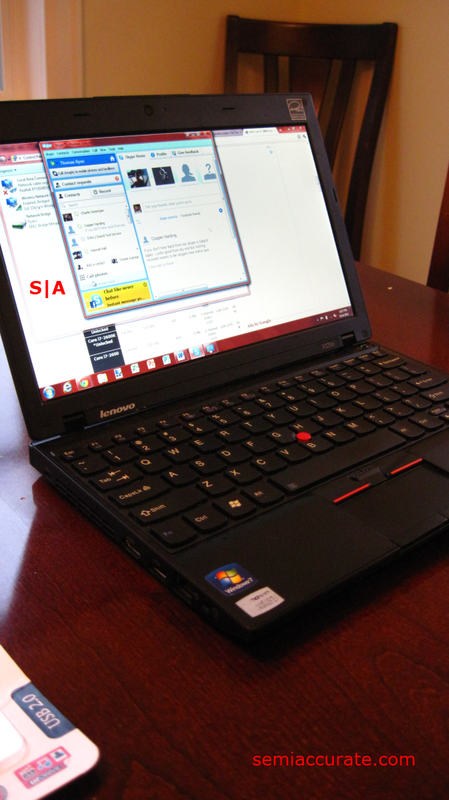 For our comparison platform we used the X120e I reviewed back in May. This particular build sports one of AMD’s E-350 APU’s, an 11.6” 1366 by 768 screen, 4 GB’s of DDR3 RAM running at 1066 Mhz, an a Western Digital 5400 RPM hard drive. This configuration is a pretty good representation of what a high-end x86 Windows tablet will be packing in terms of hardware around the time Windows 8 launches next year. The thing that will most likely change between now and then are the use of an SSD by most OEMs and a refresh of AMD’s APU lineup as well as Intel’s competing SOC lineup. In order see if there were any performance differences between Windows 8 and Windows 7 I ran a few benchmarks including wPrime, Cinebench R11.5, Counter-Strike: Source, and ComputeMark V2.1 to get a baseline for Windows 8 performance so I could compare it to Windows 7. Disappointingly, in order to upload my ComputeMark scores to the web, Windows 8 had to go through some feature enabling dialog boxes and download something from Windows update in order to get .NET 3.5.1. Following that, the application encountered an unhandled exception when I tried to finish the uploading process. I would definitely chalk this issue up to Windows 8’s security and application privileges system, because it seems to dislike the way that this application is trying to reach out to the internet. 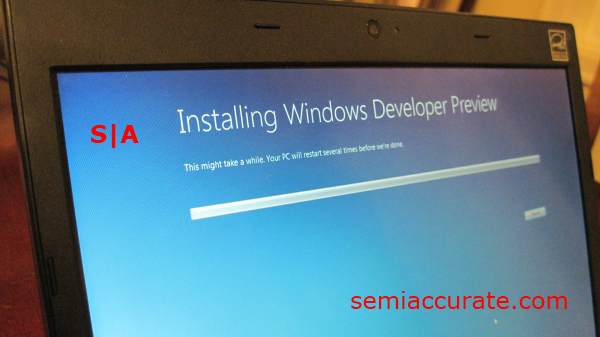 wPrime runs in administrator mode only; it errors when standard application privileges are used, and can’t detect the hardware platform when running in Windows 8. Cinebench also runs only in administrator mode. It will start as a process, but fails to display in standard mode. Steam and Counter-Strike worked just fine. The lack of issues from the two of them, both in terms of compatibility and in terms of performance surprised me initially. I doubt the server I joined in Counter-Strike had any idea it was trading packets with a platform running Windows 8; the compatibility was that good. Let’s try and analyze these Windows 8 benchmarks now. It appears that OpenGl rendering performance in Cinebnech under Windows 8 has regressed. This difference is probably due to the immaturity of AMD’s drivers for Windows 8, although it could also be an example of a compatibility issue. 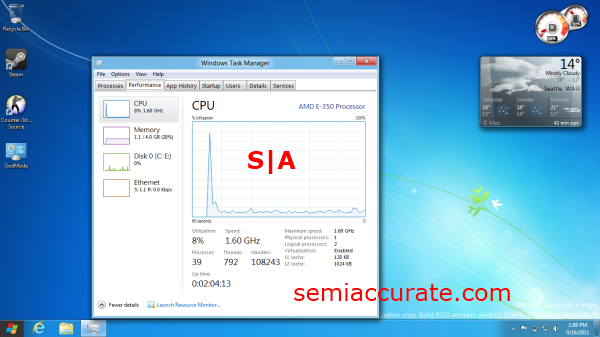 A 9 percent increase in terms of CPU performance is a nice boost for Windows 8 though. The question this result begs though, is whether Windows 8’s reduced resource consumption or improved resource utilization is to account for the improvement in performance. The Counter-Strike benchmarks are pretty much a wash. It looks like AMD’s drivers support DX 9 games on Windows 8 just as well as they do for games on Windows 7. wPrime shows a 7 percent decrease in calculation time under Windows 8 when doing it’s 32M test and a 1 percent decrease on its 1024M test. 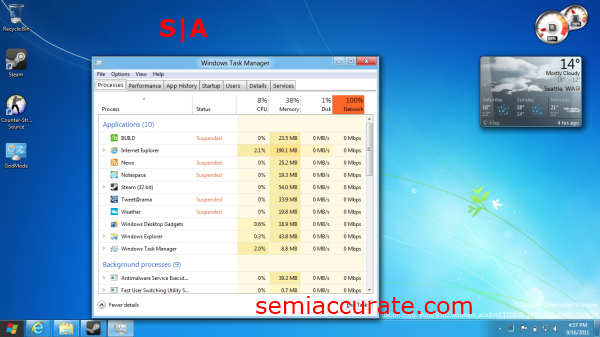 So equal or better performance with Windows 8, which is not at all a bad result. Now here is where things go off the deep end; ComputeMark. It’s hard to learning anything from those results other than E-350’s are slow at compute tasks, and ComputeMark does not get along very well with Windows 8. It should be noted that all of the ComputeMark tests executed just fine in the Windows 8 environment, something just went haywire with the scores. As far as running the Windows 8 testing platform on a Windows 7 network goes, there were some issues. 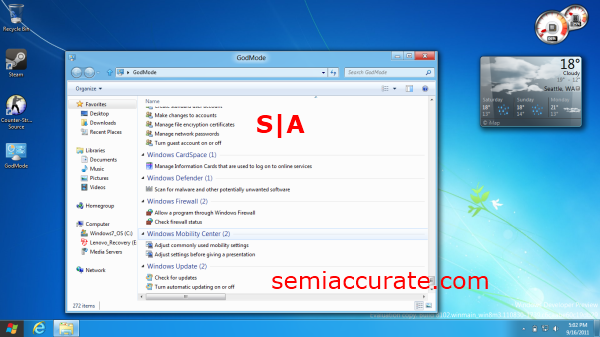 Windows 7 PC’s can detect their Windows 8 counterparts within a home network,but they cannot access their file systems. 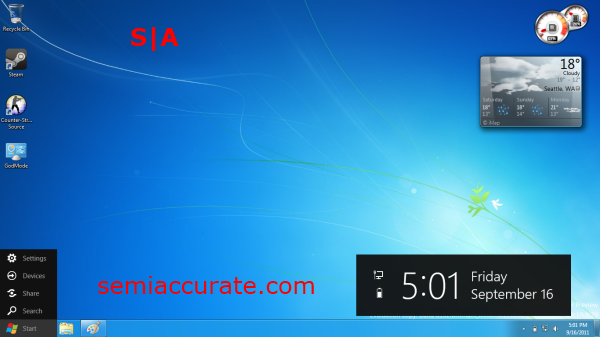 On the other hand Windows 8 PC’s can access the files systems of Window 7 PC’s without any issues. On a lighter note, bridging connections works normally when a Windows 8 PC is used as the intermediate between the Internet and a Windows 7 PC. Almost everything seems compatible in the desktop mode, just as Microsoft has promised. But some applications do require you to run them as an administrator, which may not have been required in 7, and still others have nervous breakdowns in the new environment. This is really only a minor annoyance, but considering that the applications I ran on my testing platform were benchmarks and games, many of which automatically detect your hardware, it’s not all that surprising that this is the case.